Bishop Torreggianni had also arranged with Mary MacKillop to receive a community of sisters for Inverell. Mary expressed her pleasure to Sr Bonaventure, NSW Provincial for “managing to open Inverell” (18 May 1880). Three Sisters, Casimir, Lucy and Philomena arrived there with the Provincial on 11 June 1880. Their early letters described how the ladies of the parish had prepared the house with Chinese matting on the floor, a piece of carpet before each bed and a well-stocked pantry. The paster, Fr Cherubini OSFC, they found to be like their dear friend in Bundaberg, Fr Rossolini. School commenced with 57; by the end of July the enrolment had doubled to 105. Sr Casimir Meskill wrote to Mother Mary (26 July 1880): “They intend beginning a new schoolroom next month. It is to be on the church ground and is about five minutes walk from the convent. We are all well and happy, thank God. I know nothing will please you better, dear Mother, than to hear that“. 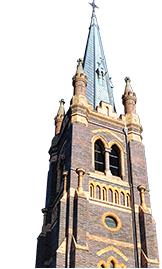 Dr Torreggianni requested a Mercy community to take over the Josephite primary school at Inverell and to establish a high school. This work began in January 1891. In addition to their teaching duties in the school the Sisters had a boarding school for girls from primary to high school level and a boarding school for boys to the age of 12. A second primary school was established at St Mary’s, Rose Hill and the Sisters travelled there daily to teach. The school was closed in the 1970’s with the movement of primary students to the Holy Trinity site.